As far as web sites go, there’s only one site I look at more than Google Reader. You’re on it right now. There’s nothing technically “wrong” with Google Reader, but when you look at it every five minutes, every day of your life, another RSS reader option is super exciting. Enter Subpug. It’s a new RSS reader that just launched on Christmas and it’s pretty slick if I do say so myself. It’s aimed toward more of the light news reader, rather than someone like myself with thousands of subscriptions. Still, it gets the job done. You can choose from certain pre-subscribed options like Gadgets, Music, Fashion, and even Geek Humor, or you can build your own/import your Google Reader OPML. The set up process takes all of three seconds and you’re ready to read, mainly because there’s no sign up or log in of any kind. The first thing you’ll notice is that it’s a totally different look from Google Reader, with a grey background and a nice, clean layout. But there’s more: on the left-hand side of the page you’ll see comments from the story that’s highlighted. I find this to be a pretty smart addition to your average RSS reader. I mean, what’s a post without the comments? Users can also choose to hide certain topics from specific feeds, and there are options to share on Facebook, Twitter, Google+ etc. Subpug also added some cool cross-device functionality. One thing that really bugs me about Google Reader is that it doesn’t translate well to mobile, at least on iOS. Android users are lucky enough to have a pretty solid Google Reader app, but the same certainly isn’t true for the iPhone clan. Google Reader in mobile Safari is tolerable, but nothing special. For something better you have to pull your Google Reader subscriptions into a third party app. 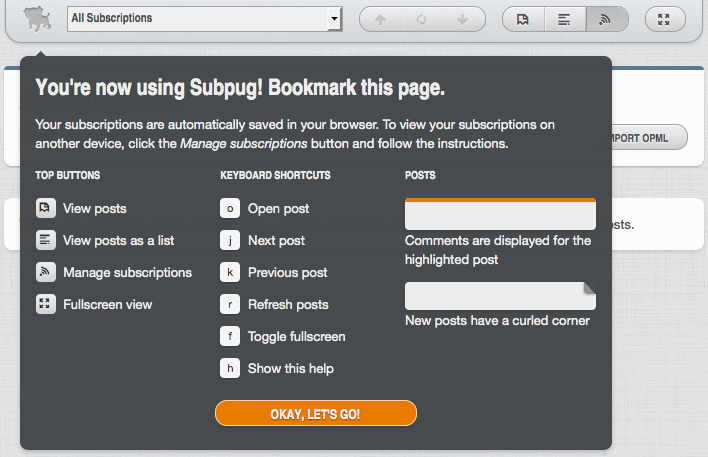 Getting Subpug up and running on your phone and/or tablet is easy as pie. Simply enter your email address into the proper field on the settings page, and you’ll be sent a link. Click the link on your phone, bookmark it, and you’re ready to go. On mobile the experience can be a bit frustrating if you have thousands of subscriptions (it loads a bit slow, and froze on me once), but as I said Subpug is meant for the casual reader. I also found that the desktop web app loads slower than Google Reader, so it then becomes a trade-off. If a fresh new look and the ability to read comments as you go is important, a few extra seconds during refresh may be a fair price to pay. If speed is the name of the game, you may want to wait until Subpug cleans itself up a bit. Either way, we’re glad to see another strong option fall into the RSS reader category.